SSC Junior Engineer JE Recruitment Online Form, Educational Eligibility Criteria, Age Limit, Age Relaxation, Exam Pattern, Mock Test Papers, Syllabus, Important Links, Important Dates and Post details. Here all Information about SSC Junior Engineer Recruitment 2019. 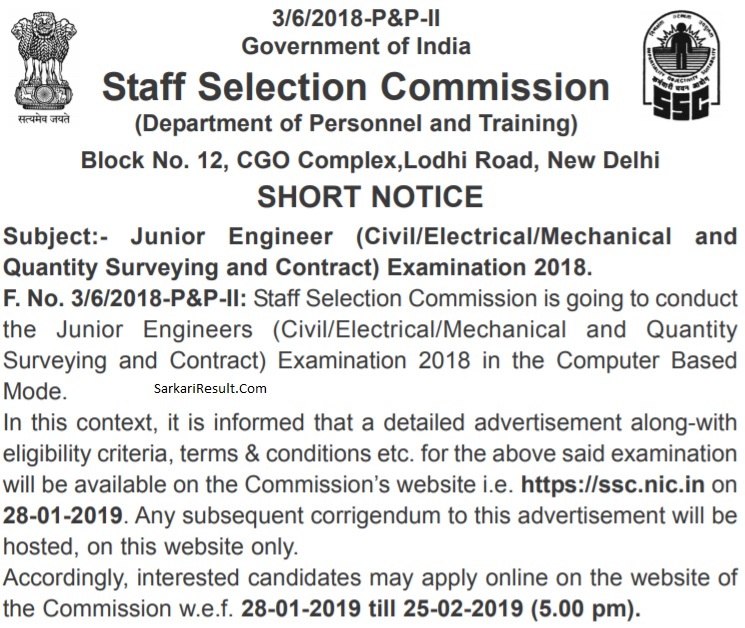 Staff Selection Commission (SSC) has announced notification for the post of Junior Engineer. Here you will get information about SSC Junior Engineer Recruitment Application pattern, SSC Junior Engineer syllabus, SSC Junior Engineer eligibility criteria, SSC Junior Engineer exam details and SSC Junior Engineer application fee details etc. Here we have provide all the required information about SSC Junior Engineer Vacancy Details, SSC Junior Engineer Important Dates, SSC Junior Engineer Educational Qualification, SSC Junior Engineer Recruitment Age Limit, SSC Junior Engineer Recruitment Exam Date, SSC Junior Engineer Exam Pattern, SSC Junior Engineer Syllabus, SSC Junior Engineer Recruitment Application Fee etc. Staff Selection Commission SSC has giving a great opportunity for all those eligible Candidates Who preparing State Government Exams. Any Candidates can leave their respective suggestions and query in the comment box. Any doubt and question about SSC Junior Engineer Recruitment 2019 will be welcomed and we will try to solve your relative query and doubts.